John Muir—AKA John of the Mountains, AKA Citizen of the Universe, AKA Wilderness Prophet—carried that cup with him on a trip through the plot of land that, just five years earlier, he had helped to establish as the United States’ third National Park. 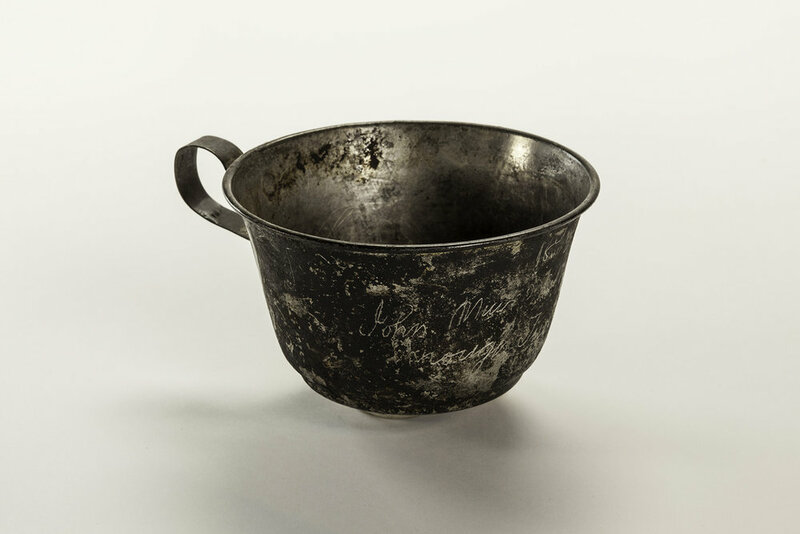 John Muir's tin cup. Photo courtesy the National Park Service. In 1912, Muir published The Yosemite, a book collecting his observations of California’s Central Valley region over the previous 43—that’s right, four three—years. In the book, a lean 320 pages, he uses the word beauty or beautiful(ly) 119 times. The first chapter contains 37 instances alone. Now, I’m not a god-fearing man like Muir was. I don’t believe in heaven or hell or gods or devils. But I definitely believe in beauty. And I believe every living creature on this planet has some non-physical, unquantifiable portion of their being. For lack of a better description: a soul. We’ve got those beliefs in common. But I think what Muir was trying to say is that food can only feed the body. To nourish the entire person—the body and the soul—you need to find a certain type of beauty in this world. The type of beauty that moves you. The type of beauty that punches you in the chest. The type of beauty that grabs you by the back of the neck and pulls you up so high that you can’t help but look at the world from that new perspective. For Muir, that special beauty was the outdoors. Now, I tend to not disagree with folks who have more than two appellations, but I have to push back on the Prophet a little bit here. While I agree that nature has the power to feed more than just the physical part of a person, I think food does, too. I had an egg once that changed my life. It was a poached farm egg on top of crispy rice with seasonal veggies at Empire State South in Atlanta. When I tasted that yolky, crunchy morsel I floated out of my body and witnessed myself in a state of pure bliss, the same way folks do on an ayahuasca trip or during a near-death experience. I had a dessert once that made me question reality. It was a vanilla bean ice cream with creamed corn and tangerine marmalade at Girl & the Goat in Chicago. Those flavors made no sense together in my head, but once they melded in my mouth I wondered if I had ever actually tasted anything before. I don’t have a god, but for a brief few moments on that day, Stephanie Izard was my god. I had a beer once—and what is beer but liquid bread—that made me believe in aliens. Or witchcraft. Or maybe that’s when I truly started believing in the soul. It was the legendary Belgian Trappist Ale called Orval, and I can’t even remember where I had it for the first time because everything that wasn’t Orval just fell away. Once I tasted it I knew that whomever—or whatever—had made it was more than just corporeal. There was something so beautiful about it. Something so right. So pure. So natural that it seemed completely unnatural that something could be that natural. So simple as to be complex. I’ve had it many times since. Hundreds, maybe. Even now, occasionally, I find myself lost in its foam. Drawn in and enchanted by its walls and pockets and undulations. It creates landscapes within the glass, not altogether different from those Muir witnessed in Yosemite. There’s something astonishing about Orval. There have been times I swear I’ve seen the foam crawling up the side of the glass, rather than sliding down it, as if trying to escape its silicate confines. And then the taste! The minerality is uncannily earthen, like atomizing stones to component parts. Like liquifying the granite of Half Dome. Like lapping up the essence of this rock we call home. Which seems like exactly the kind of sentiment Muir could get behind. This Saturday, March 23, is Orval Day—a worldwide celebration of a beer that has connected with so many souls through the ages. I encourage you all to find a bar or buy a bottle, raise your chalice, your glass, or your tin cup to John Muir, and toast to beauty and bread.